Rob Fleming was elected to represent the riding of Victoria-Hillside on May 17, 2005, and was re-elected to represent Victoria-Swan Lake on May 12, 2009 and May 14, 2013. Rob serves as the Minister for Education. 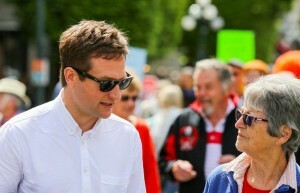 Rob was the critic for the Environment in the 39th Parliament (2009-2013). Previous to that he served as the critic for advanced education and tourism. In the 38th Parliament (2005-2009) he was the chair of the Legislature’s Public Accounts Committee and has also served as vice-chair of the Select Standing Committee on Education and the Special Committee to Appoint an Ombudsperson. Rob has a Bachelor of Arts degree from the University of Victoria. He has worked in research and communications and was a research and policy analyst for the Ministry of Advanced Education. He was involved in many community organizations and travelled to El Salvador to monitor elections there.